It's easy to forget during the mid-summer Laelia purpurata explosion that not all Laelias flower in summer. One of my autumn favorites is Laelia perrenii, flowering now in the Fuqua Orchid Center. Laelia perrenii is a warm to hot-growing Brazilian species that is much less common in cultivation than the enormously popular L. purpurata. The ragged margin on the upper part of the lip gives the flower a totally distinctive look, like torn fabric. 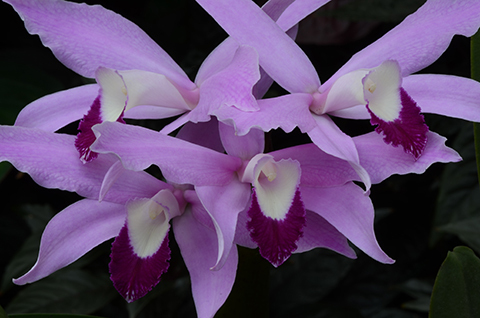 It is an undemanding orchid, easy to grow in a greenhouse that is hot, bright and dryish. For most of the year our two plants are hard to spot among the hundred or so Laelia purpurata in our back up greenhouse, but when they flower in autumn I always wish that we had bunches of them. Definitely time to set a capsule on Laelia perrenii. You can see this wonderful orchid on display right now in the Orchid Display House.